The Antechamber is a room inside the Old Clockworks in Luigi's Mansion: Dark Moon. The Antechamber is accessed by taking the east door inside of the Quarry. This room is a large hallway with three alcoves. The hallway is blocked off by many spider webs that must be burned away. The area to the north of the Antechamber is the Tomb. 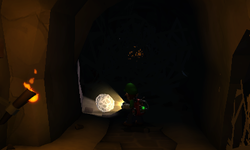 During C-2: Underground Expedition, Luigi needs go into the Antechamber to reach the Tomb which is at the end of the hall. There is a wad of spider webs that Luigi can carry with the Poltergust 5000. He must light it with the nearby torch and burn away the webs in the hall. Luigi can also burn the webs that block the alcoves for several items. The first alcove has a Treasure Chest filled with coins, bills, and Gold Bars. There is also a Gold Bar sitting inside a small hole. The second alcove has two Gold Bars and a spider web blocking off some hearts. The third alcove has four gold spiders. This page was last edited on May 1, 2017, at 21:22.